Hello all, I'm wondering if it's possible to show action groups in context mode, alongside the tasks they contain. My tasks don't make much sense when divorced from the action group, so even though I have the Project showing in context mode, this isn't enough information. This is confusing: What am I emailing Brian about? What ideas am I asking Sylvia about? The only way to find out is to switch to project mode so I can see the action groups. From the project "Chapter 1:"
With the action groups in view, the tasks suddenly make sense. But you really shouldn't have to switch out of context mode to see this info. 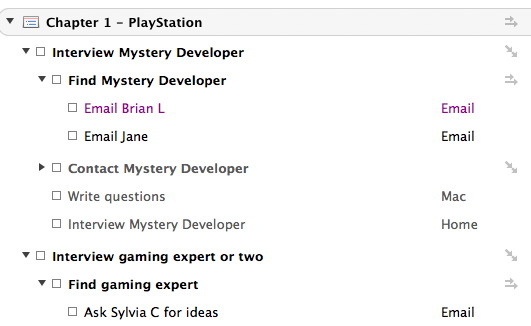 Ideally, within context mode, the task "Email Brian L" would be followed by "Find Mystery Developer / Interview Mystery Developer / Chapter 1 - PlayStation" instead of just "Chapter 1 - PlayStation". If it's not possible to enable this -- can someone tell me whether it is or not? -- I'll certainly be emailing this in as a feature request to OmniGroup. In the meantime, as a workaround, I could go through all the tasks (that I just dumped in for this new set of projects) to manually rewrite them with the contextual info as such - "Email Brian L to find mystery developer for interview". Last edited by ryantate; 2010-02-28 at 11:48 AM..
Groups, Projects, and Inbox items now show up in Context lists, Due lists, and Flagged lists. When actions are sorted by project, parent items follow their children (which is the natural order for completing them). Single Action Lists are not actionable, and do not appear in Context lists. the name of the Action Group in my case ("Find gaming expert") is not always a task unto itself. And even if I made all Action Group names into tasks (not sure this would work), there's not yet a way to assign context to the Action Group so it doesn't show up in a Perspective unless you have "No Context" selected. If you drag an action into a folder, OmniFocus helpfully converts it into a Project and STRIPS all context information from it. Oy. Folders do not have the ability to specify sequential vs parallel the way Projects and Actions Groups do so you lose information. Basically what needs to happen is that Action Groups need to become full fledged nested Projects. In Context view, Sub project names would be displayed with full breadcrumb trail showing all parent projects to the right of one another. OmniGroup could then nuke the whole concept of Folders and use parent Projects in their place (why not?). Then you'd end up with ONE type of object where you once had THREE. Which makes the software easier to learn. Last edited by ryantate; 2010-02-28 at 03:06 PM..
Last edited by ryantate; 2010-02-28 at 02:54 PM..
That would give you the ability to show / hide projects based on the completion of not just other projects but other actions - which would give great flexibility ESPECIALLY as time and time again project start times overlap - sometimes the pre-production for something starts half way through another project once a specific action or milestone is met or completed. Some nifty way of adding the start date in the start date box as a dropdown of other projects would be a good start - or something like that! Be nice not to have to use the inspector for this. I'm pretty sure we have a feature request open on showing action group names in context view in some fashion: emailing the support ninjas and let the team know you'd like to see that happen. In the meantime, I'd recommend making action names understandable/actionable on an individual basis as much as possible. Using a random example from earlier in the thread, "Email Brian L and Jane to find mystery developer" is a similar amount of typing to the nested pair of actions, but is more understandable when viewed later in context view.